Some countries have consistently strong finances and stable currencies. Others are serial offenders, with high inflation and regular devaluations. 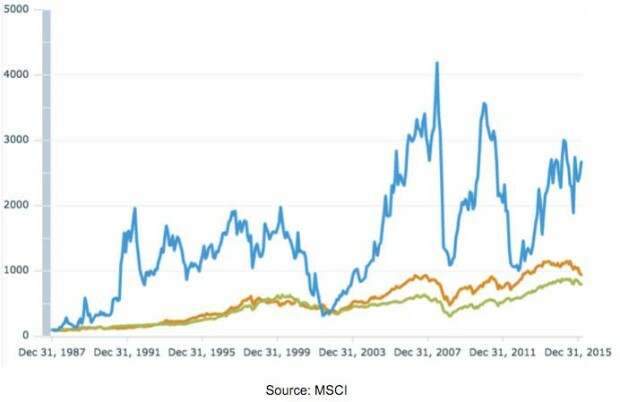 Does this matter for you, as an investor in stock markets? The evidence is surprising. Last week I received an email from a reader, Rakesh L., with some interesting suggestions in it. My last article, “Putting options in their place”, dealt with some of the issues and risks to do with using put options, a type of financial derivative. Investing in a hard currency or hard currency area is a cardinal principle. Law and order go hand in hand with hard currency area. Pell-Mell is a hallmark of soft currency area. Whenever I flouted the basic rules, I found myself in the soup. I used to think the same way as Rakesh. I still agree with him in some ways. But evidence I’ve unearthed in recent years has made me think differently. First off, how do I agree with Rakesh? I agree that financial and economic mismanagement of a country or other currency area (there are 19 countries that use the euro) will result in a mess in the end. In the battle between markets and political incompetence the markets always win, eventually. If the fundamentals are poor then a weak currency will result. That can be a steady and continuous process, or a sudden devaluation when the dam eventually bursts. The main causes are usually too much government debt, too much money printing, large trade deficits, or a combination. Listed companies in a given country usually make most of their underlying profits in the local currency. Most of their assets are valued in that currency as well. This means that if there is a large local currency devaluation then foreign investors will suffer. Those assets and earnings will suddenly be worth a lot less when converted into, say, US dollars. So far so good. Devaluations are bad news in the short term. But this is where things start to get interesting. Taking a longer term view weak currencies appear to matter much less. In fact there is good evidence that stocks from countries with the weakest currencies often go on to be the best investments. Not always of course, but on average. This is completely counter-intuitive. So I’d better back it up with some good evidence if you’re going to believe me. In fact I’d better back it up with strong evidence if I’m going to believe it myself. First let’s start with some evidence that says the opposite, that strong currencies are best. I’ll do this by comparing Switzerland with the USA. Switzerland is generally and correctly seen as a safe and stable country with a strong currency, the Swiss franc. Obviously the US is the world’s largest economy. Its stock market makes up about half of the total value of all global stock markets. The US dollar is the world’s dominant reserve and trade currency, at least for the foreseeable future. The US is much bigger and more powerful, but in terms of law and order Switzerland is the clear winner. It has the 11th lowest homicide rate in the world, whereas the USA’s rate is over six times as high, and the highest among developed countries. The USA’s incarceration rate – the proportion of the population serving a jail term – is over eight times as high as in Switzerland. Now let’s compare their stock market performances. The following chart compares the MSCI Switzerland (in green) with MSCI USA (in orange) since December 1969, the earliest data point. Both show total return – meaning capital gains plus dividends – before taxes and measured in US dollars. Over those 46 and a bit years Swiss stocks have been the clear winners. They’re up 12.7 times in US dollars against 9.9 times for the USA. Over that same period the Swiss franc is up 4.2 times against the US dollar. Put another way, the dollar has lost 76% relative to the “swissie”. So is that case closed? Does this mean stocks from a country with a strong currency will always beat stocks from a country with a weaker currency? Actually no, for a variety of reasons. The first is to point out that the Swiss stock market is dominated by large international companies. They may report their accounts in Swiss francs, but they actually earn most of their profits overseas. This is different to most countries. The biggest “Swiss” companies by far are Novartis (pharmaceuticals), Nestle (food and drinks) and Roche (pharmaceuticals). Following that – but much smaller – are big international banks and insurance companies (UBS, Credit Suisse, Swiss Re, Zurich Insurance) and a smattering of other international industries. So these companies and their stocks have performed well, but almost certainly not because of the strong Swiss currency. In fact that has been a handicap to some extent, as it has meant high costs in the home country (head offices and so on) in relation to overseas sales. Nestle, Novartis and the rest peddle most of their wares in international markets, far from the Swiss border. A lot of those sales are made in countries with weak finances and weak currencies. In other words, when you buy the Swiss stock index, buried within its companies are the equivalent of stocks from weak currency countries, just with Swiss management at the helm. Let’s now turn to countries with a history of especially weak currencies. By way of example let’s take another look at Argentina – not least because Rakesh’s email was prompted by last week’s article on that country. The next chart compares the MSCI Argentina index (blue) with MSCI Switzerland (orange) and MSCI USA (green). The data starts in December 1987, and again shows total return before taxes, and measured in US dollars. 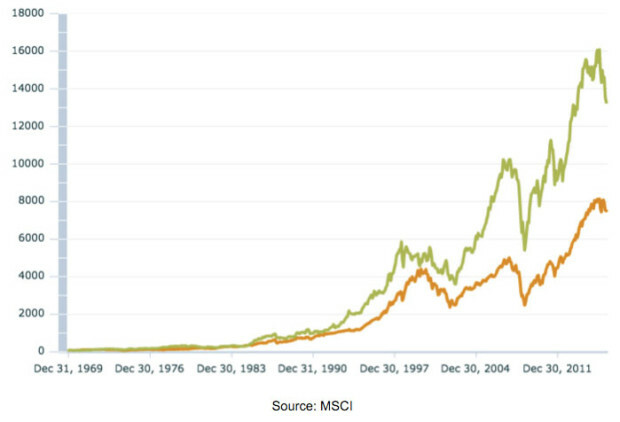 ….but Argentine stocks clearly beat them both. Really? On this shorter time frame – which is still just over 28 years – Argentine stocks were up 26.7 times in US dollar terms, against 9.5 times for Switzerland and 8 times for the USA. This result is extraordinary. Especially when you realise just how weak the Argentine currency has been, and how much turmoil the Argentine economy has suffered at the hands of incompetent politicians. Since December 1987 the peso has lost a staggering 99.997% against the US dollar. Argentina suffered from severe hyperinflation during the late 1980s and early 1990s. Consumer prices were rising at an annual rate of 20,263% in March 1990. Between December 1987 (when the chart starts) and December 1991 the exchange rate went from 5.1 pesos per dollar to 10,028 – a loss of 99.95%. Then – long story short – a new peso was introduced, and it was pegged to the US dollar at one-for-one until late 2001 to curb inflation. Unfortunately it was the “right” policy at precisely the wrong time. Argentina is a commodity exporting country. During the 1990s the US dollar was strong and commodity prices were weak. Export income fell, domestic production prices rose relative to competitors, and imports became cheap. Business suffered. The government borrowed to paper over the cracks. In the end the country defaulted and devalued (again) in 2002. Initially the peso lost three quarters of its value. 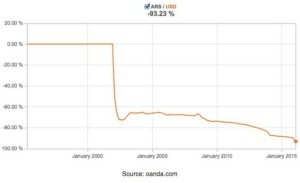 Savings were decimated, including the forced conversion of dollar bank deposits to pesos just before the devaluation. Dollar debts, such as mortgages, remained. Many people’s life savings were wiped out at a stroke. After that the peso bounced a bit, staying stable until 2008. Then the money printing started in earnest once more. The last government sent up its proverbial helicopters full of cash, and showered it down on the public sector in vast quantities. This led to price inflation of up to 40% a year and a further 80% loss of value against the dollar. Overall the peso is down over 93% since the dollar peg broke in 2002. Given this inept economic and financial “management” by successive Argentine governments, it seems amazing that Argentine stocks could have outperformed the USA by such a wide margin – let alone Switzerland. 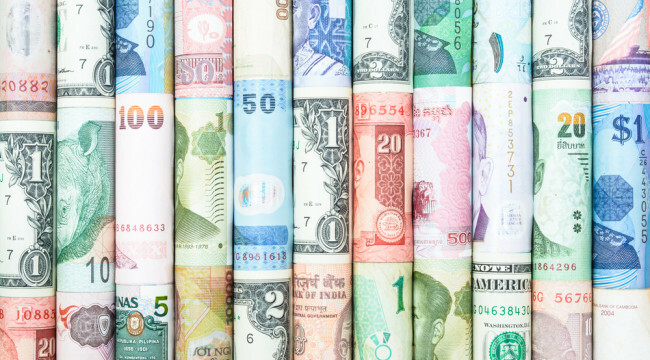 Against all our intuition and expectation, countries with the weakest currencies tend to have the best performing stock markets in subsequent years – measured on a like-for-like basis, such as in US dollars. This is something that all investors need to be aware of if they want the best results. Marco Polo worked for 15 years in the investment banking industry in London and Hong Kong. He has worked in online financial publishing since early 2010 as an investment strategist, stock and fund analyst and writer. He is now based in South America, where he has lived since 2008. He has seen both the best and the worst of the financial services industry up close. Just like the original Marco Polo (1254-1324), he likes to travel. And he sees investing as an unending journey of learning and adaptation. The world is constantly changing, and our investment strategies need to adapt over time.